On the alien, sunless planet they call Eden, the 532 members of the Family take shelter beneath the light and warmth of the Forest’s lantern trees. Beyond the Forest lie the mountains of the Snowy Dark and a cold so bitter and a night so profound that no man has ever crossed it. The Oldest among the Family recount legends of a world where light came from the sky, where men and women made boats that could cross the stars. These ships brought us here, the Oldest say—and the Family must only wait for the travelers to return. But young John Redlantern will break the laws of Eden, shatter the Family and change history. 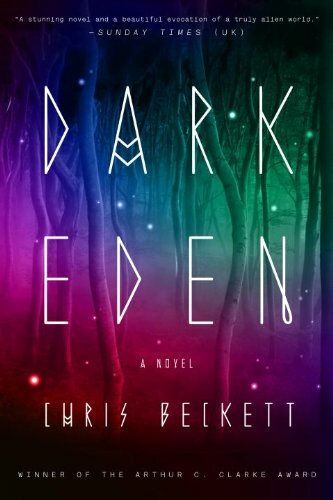 He will abandon the old ways, venture into the Dark...and discover the truth about their world.Already remarkably acclaimed in the United Kingdom, Dark Eden is science fiction as literature: part parable, part powerful coming-of-age story, set in a truly original alien world of dark, sinister beauty and rendered in prose that is at once strikingly simple and stunningly inventive.